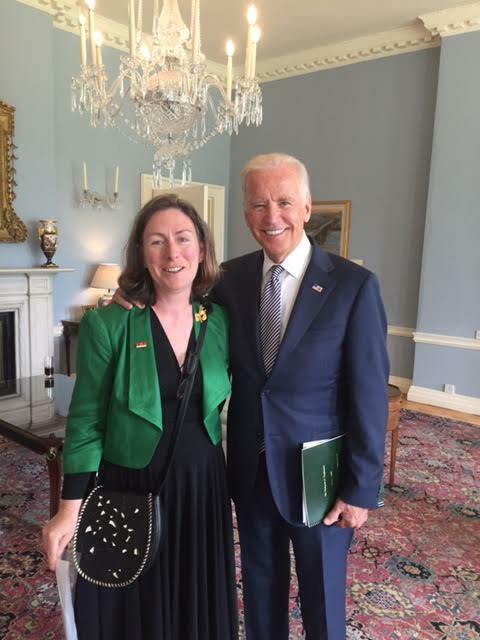 Irish Family History Research Experts Fiona Fitzsimons and Helen Moss are delighted to have been chosen to research Vice President Joe Biden’s Irish Family History in time for his trip over to Ireland to visit with his family’s ancestral home. We are delighted to be able to share our work with you on this wonderfully exciting story behind the Vice President's Irish past. "Stories get passed down in families, & tales can be changed as they're passed on... What these ladies have shown me is how accurate my mother's, uncles and grandfather's stories were. I've waited my whole life for this". Fiona Fitzsimons presents the Vice President and his family with his Irish family history story. Blewitt/Bluett/Bluet/Blueit/Bluitt/Blewett are all variations of the same surname. It is quite rare in Ireland with the largest concentration in County Cork. Throughout this report we have used the spelling that is used in the original documents, and otherwise have used Blewitt as the most consistent version. The Vice President’s earliest traceable direct ancestor is his great-great-great grandfather Edward Blewitt (ca. 1795-1872), born in north county Mayo, Ireland. 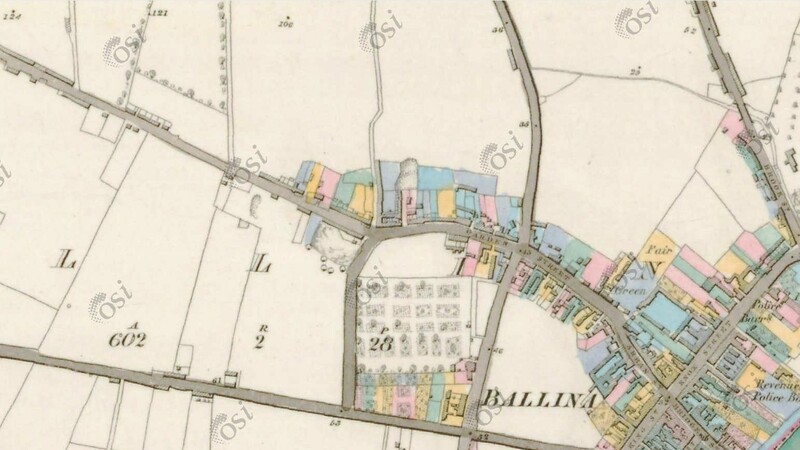 Our first documentary evidence for Edward Blewitt is in the parish records for Kilmoremoy, in the picturesque town of Ballina. The town’s name is derived from the Irish ‘mouth of the river or ford’ and it is located at the head of the river Moy overlooking Killala Bay. It was here that we know that at least three children were born to Edward Blewitt and Mary Mulderg, including the Vice President’s great-great grandfather, Patrick Blewitt baptised in 1832, when the couple were living in Patrick Street, part of Garden Street, in the heart of the town. It is disappointing that parish registers for Kilmoremoy only start in 1823 for baptisms and marriage's preventing us from determining Edward Blewitt's exact year of birth. Whilst we have been restricted by the parish registers we have however been able to uncover a wealth of new research concerning Edward Blewitt’s burgeoning career. When the army engineers of the Ordnance Survey arrived into town, Edward Blewitt applied for a job and was duly hired. His job was surveying and the experience was to serve him very well down through the years. The Ordnance Survey was an immense, efficient and meticulous machine systematically plotting each ditch, hill and stream. Edward spent nearly three years working for them until there was no need for his services as the work in the area was nearing completion. The next evidence we have for employment is as an apploter (a geographical surveyor and valuer) for the valuation office (Griffiths Valuation). We have an example of Edward Blewitt's own hand writting in a letter to Dublin Castle in 1845. A copy of Edward Bluett’s handwritten letter. The year 1845 heralded the start of the Famine in Ireland and Ballina and the county of Mayo was one of the worst hit areas in the country. In February 1848, Edward found work as an overseer for the Ballina Union workhouse. It would not have been easy work and Edward would have seen the worst of the effects of the Famine as the union workhouse built only to accommodate 1,200 catered for up to three times that number as those searching for relief made a steady path to its doors. Ballina Workhouse:In 1848 Edward Blewitt was appointed as overseer of Works by Ballina Poor Law Union. He continued in this capacity as late as August 1850. Ballina Dispensary, only part of workhouse complex still standing today. Edward's son Patrick briefly worked in Ballina as an overseer of public works. He left Ireland by Autumn 1850 to settle in America and became a sailor. By 1851, Patrick Blewitt returned to Ireland to bring his parents and siblings to America. The Blewetts settled in Scranton PA. Edward Sr. got a job as a weigh-master in the Ox-pond mines. His eldest two sons married. John Blewett became a miner. By 1860 Patrick Blewett gave up the sea and became a surveyor. Edward Blewett Sr. died in 1872 in a drowning accident. Surveying and engineering appear to have been in the Blewitt family genes. Patrick Blewitt (1832-1911) who left Ireland in 1850 became a mining inspector and while based in Scranton also worked in South America. His son, Edward F. Blewitt, named after his paternal grandfather was born in New Orleans in 1859. Who knows if his grandfather told him stories of theodolites, maps and tramping the boggy fields in Mayo? We do know for certain that Senator Edward F. Blewitt graduated as a civil engineer and went on to be employed as a city engineer for Scranton before his election to the Senate in 1907. [This volumes stops in March of 1848]. The Vice President’s great-great grandfather, Owen Finnegan, left in the late 1840's for America. Previous research undertaken by genealogist Megan Smolenyak identified Owen’s marriage in 1839 to Jean Boyle in county Louth. Owen and Jean’s first four children were born here, including the Vice President’s great-grandfather, James Finnegan born 1840. This is what we’ve found that is new. An in-depth study of the Irish (parish, tax and land) and American records (census, deaths, burials, newspapers), indicates that the Vice President’s family originated in Templetown on the southern coast of the Cooley peninsula. We have found the baptism in 1814 of the Vice President's ancestor Owen Finnegan, son of John Finnegan and Mary Kearney of Templetown. Templetown townland is bordered on one side by the coast and it is here where the Finnegan family lived and worked, deriving an income from both the land and sea. So it would seem that the VP's ancestors had an entrepreneurial streak, which they put to good use harvesting sea-weed, hence the significance of the Kearney and Finnegan familys' long association with Maranatra in Templetown. We traced the Finnegans and Kearneys from 1766 to an area within Templetown townland named ‘Maghernatra’. In the 1850s Owen Finnegan (1814-1874 ) and his family settled in Ovid Township, Seneca, NY. The evidence of the U.S. and Irish sources taken together, indicates that Owen Finnegan emigrated to Seneca county with his brother John (1816 - p.1880), and other cousins – brothers George ( 1817-1894) and Richard (1819 - p.1870) Finnegan of Templetown; and another cousin Patrick Finnegan ( 1823 -1900 ) of Templetown. By 1860 Owen Finnegan was joined in Ovid by his cousins George and Richard Finnegan. Owen and George Finnegan briefly went into partnership as boot and shoemakers. By 1870 Owen Finnegan was joined in Ovid by another cousin, Patrick Finnegan, also of Templetown, Cooley parish, county Louth. The overwhelming sense one gains from the Finnegan family research is one of strong ties of kinship carried across from Ireland to America. By 1874 Owen Finnegan appears to have been in poor health. He planned to close his business, and intended to auction his stock on June 17 1874. He died of heart failure the day before the auction took place. Owen Finnegan, a well known citizen of Ovid, died in that village on Wednesday morning, 16th inst. His wife Jean died 6 months later, December 1874. We found a newspaper notice concerning administration of Owen Finnegan’s will. It showed that by 1875, the young Finnegans were scattered across America, from east to west coast. Owen’s son, James Finnegan, married in his adopted home town of Ovid but eventually made his home in Olyphant, Pennsylvania close to Scranton, where both the Blewitt and Finnegan families were to settle. At the start of our research we were asked to explore whether the Vice President had any cousins in Ireland. It would appear that many of the Blewitt and Finnegan families emigrated or lost their lives in the Famine. The Finnegan family are scattered in Cooley. 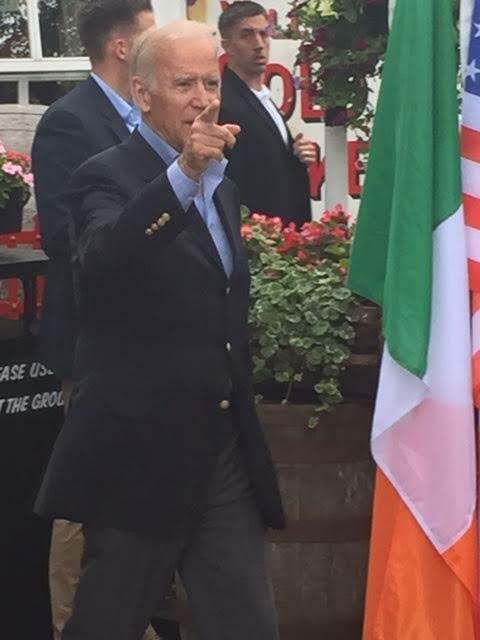 The strongest familial links that the Vice President has in Ireland are with the Kearney family - his Great x3 grandmother's birth family. Maranatra is a narrow strip of coastal land on the seashore of Templetown. The name is derived from the Irish ‘a mharadh na tra’ – literally, ‘living on the sea-shore.’ This points to something that we haven’t looked at, that your ancestors’ first language was Irish. Most people would have been bilingual, but in Cooley, English was a second language. When Owen Finnegan and Jean Boyle settled in America, they adopted the English language as their primary language for the first time. Why is the place Maranatra central to the Vice President's family history ? Maranatra is a section of the land that juts into the sea like a hook. As a result, salvage and a great deal of sea-weed is thrown up on this part of the shore. The vice president's ancestors appear to have noticed this, and they leased salvage rights on this small stretch of coast. They subsequently harvested the seaweed, and sold it to their neighbours. Seaweed contains nitrogen, and is a very effective manure. The Blayney Balfour (aka Townley Hall) estate records are extensive. Blayney Balfour allowed a high degree of sub-division of the estate. One of the very few mentions of the vice president's ancestors in the Blayney Balfour records is in or around 1770. So it would seem that the Vice President's ancestors had an entrepreneurial streak, which they put to good use, harvesting sea-weed, hence the significance of their long association with Maranatra. 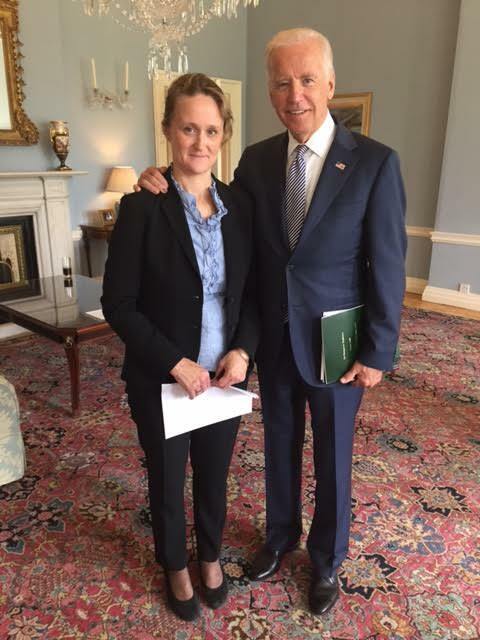 In April 2016 I was invited to a private meeting, and asked to prepare a family history for Vice President Biden, in advance of his trip to Ireland. The Vice President wanted to find out anything more about his family’s earliest origins, to identify what place(s) they were connected to, and if possible – to trace any living relatives in Ireland. Security was an issue, so discretion was important. To ensure I could complete the research-work before the visit, I enlisted my colleague Helen Moss, one of the more notable genealogists in Ireland. We were given the Vice President’s own family history files, and a published article by American genealogist Megan Smolenyak. The immigrant ancestors to the U.S. were clearly identified as the VP’s great x2 grandfather Owen Finnegan of Louth, and, on another line, the VP’s great-x3 grandfather Edward Blewitt at one time living in Ballina county Mayo. 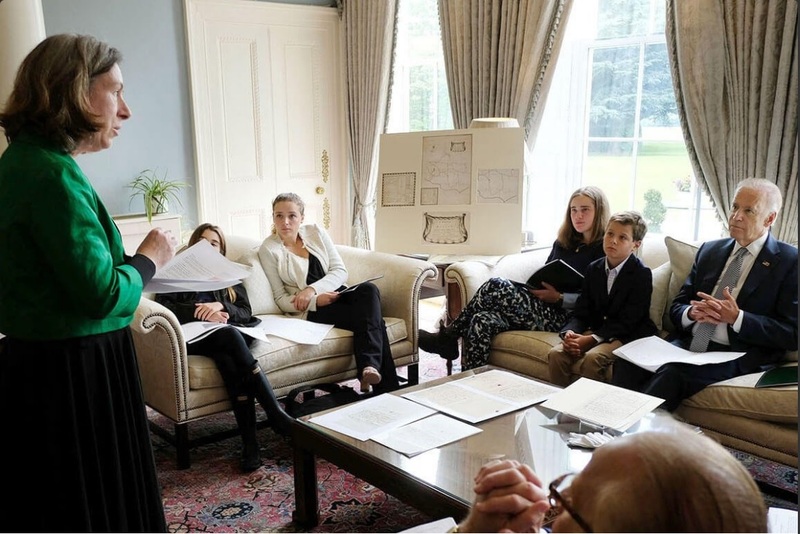 On the morning of Wednesday June 22nd Helen Moss and I were brought to the U.S. Ambassador’s residence in the Phoenix Park, to present the Vice President with his Irish family history. The National Library and National Archives provided some original documents and some copies as visuals to support my presentation. 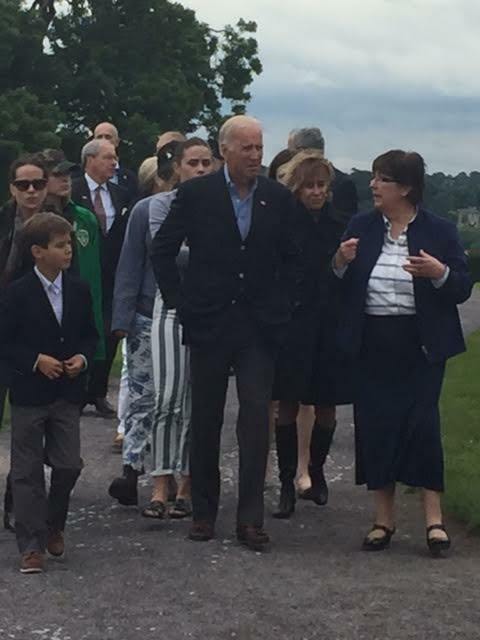 Just like their ancestral family, the Blewitts, who crossed the Atlantic in 1851, Vice President Biden travelled to Ireland with his extended family; his sister Valerie; his brother Jim and sister-in-law Sarah; daughters Ashley and Missy; and five grandchildren. 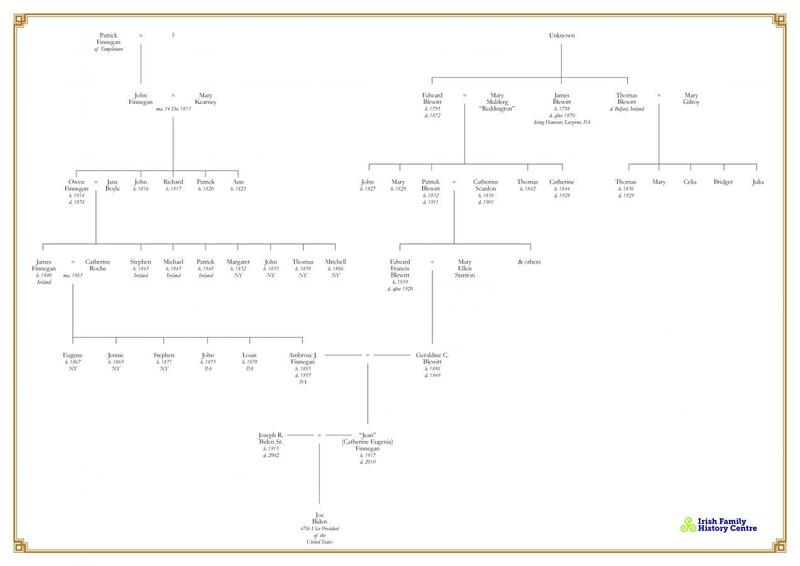 The extended Biden family were the audience that every professional genealogist hopes for. They were interested, asked shrewd questions and picked up on even the smallest details. Afterwards The Embassy took some formal photos, and Helen and I took informal selfies with the VP. 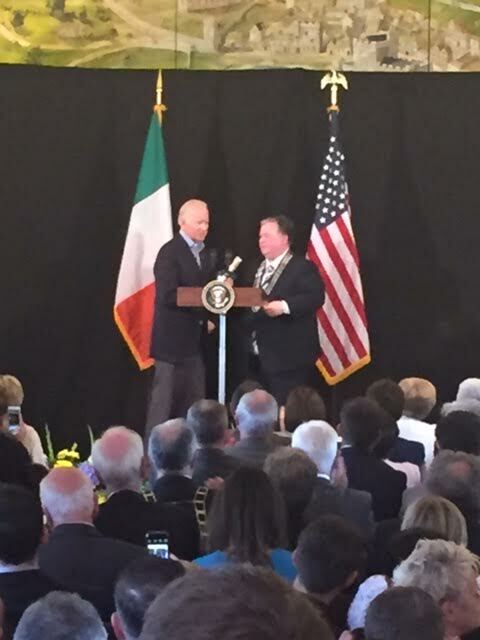 The formalities over, I joined the U.S. Vice President’s party on a road-trip around Ireland. Over the next days I met an extraordinary mix of people, from a range of different backgrounds. Conversations revealed a much bigger canvas of the world, but even from my vantage point on a small island in the North Atlantic, recognisably the same place. Thank you Anna, Rachel, the two Sams, Leigh, the two Meghans, Caroline, Kevin, Mark & Kristin, for a different perspective and for greatly adding to my enjoyment of the trip. 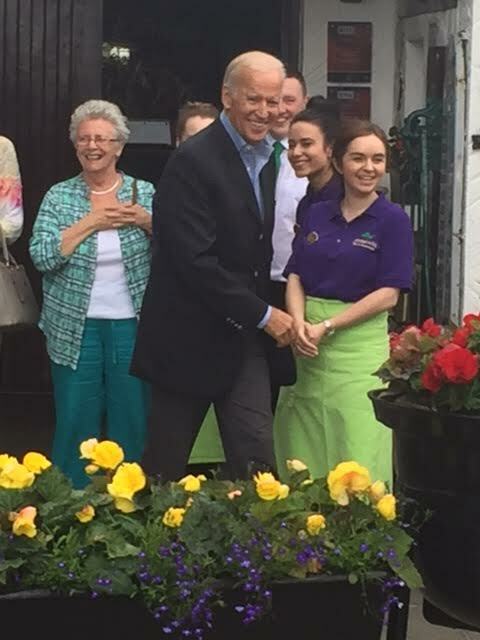 In Louth, I shook hands with Vice President Joe, and his brother Jim Biden one last time, and got back on the bus to go home.